Cookies are one of the world’s most popular treats. Whether you’re baking up a batch at home, heading around to Grandma’s house for your favorite sugary snack, or visiting a beloved bakery to pick up a dozen delicious treats, cookies are the ultimate comfort food. They’re available in many different flavors and can come in all shapes and sizes, with the greatest cookies of all able to make you smile and feel a special kind of happiness that no other treat can provide. That’s exactly what you’ll find if you choose Milk Jar Cookies. There are a lot of bakeries, dessert shops, and cookie stores to be found around California, but Milk Jar Cookies is definitely one of the best. Located in LA but offering cookie deliveries all over the country, Milk Jar Cookies excels at producing the softest, most decadent, indulgent, satisfying cookies you could ever hope to try. Every single cookie is homemade and prepared in small batches to guarantee the finest levels of quality every time, and the menu is simply extraordinary, with everything from timeless classics like Chocolate Chip and Oatmeal Raisin to more unique offerings like Chocolate Pecan Caramel, White Chocolate Raspberry, Banana Split, and Birthday Cookie. As well as offering sales of cookies for delivery all over the nation, as well as the excellent 'Cookie of the Month Club' that lets you try new delicious cookies delivered right to your door each and every month, Milk Jar Cookies can also be purchased and enjoyed direct from the store in the heart of Los Angeles, California. 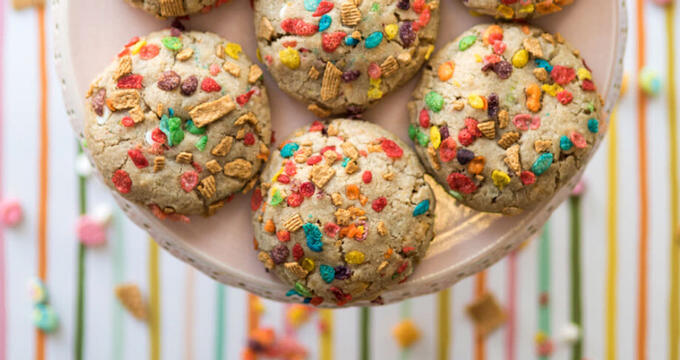 Located right in the famous Miracle Mile neighborhood of LA, the Milk Jar Cookies store is one of the best cookie shops in all of California. It's here where all the magic happens and where the amazing cookies that make up the Milk Jar Cookies menu are freshly rolled and baked every single day. The store always welcomes new visitors with a warm smile and it's a super place to come and hangout with your friends or family over a plate of cookies and a few glasses of milk. The store is located at 5466 Wilshire Blvd. Los Angeles, CA 90036 and is open every day of the week except Mondays. If you want to enjoy some delicious Milk Jar Cookies products for yourself but don't live in the LA area and can't get out to the official store for one reason or another, you don't need to worry. Milk Jar Cookies provides full deliveries of its freshly baked cookies to homes all over the nation. If you happen to live in the Los Angeles area, you can even add milk to your delivery and get it faster than those further afield, but even if you're not in LA, you can still order any of this brand's amazing cookie flavors like Peanut Butter, White Chocolate Raspberry, and Rocky Road and get one or more boxes sent out to your home. Order now and start looking forward to those soft, sweet delights heading to your door. -Popular Assorted Box - If you just want to enjoy a selection of high-quality cookies from Milk Jar Cookies delivered right to your home without any hassle, the Popular Assorted Box is a good way to start. As the name implies, this box features a selection of the most popular cookie flavors, and you'll be able to choose the size of your box to suit your needs from a half dozen box all the way up to a four-dozen box. -The Gluten Free Box - Worried about your gluten intake? Or perhaps you have a gluten allergy? Fortunately, you don't have to miss out on the wonderful delights of Milk Jar Cookies, thanks to the Gluten Free Box. Available in various sizes, this box only contains cookies that are baked without the presence of any gluten at all. -Custom Box - The Custom Box is the ultimate option for cookie fans. The contents of this box are completely up to you. You'll be given the full menu of flavors, including the gluten-free options, and can fully personalize it to suit your tastes and preferences. You can fill it up with chocolatey flavors like Chocolate Peanut Butter and Rocky Road if you like or choose a mixture of all your favorite flavors. The choice is yours. You've heard of wine clubs and other kinds of subscription-based food and drink delivery plans, but what about a cookie club? What if you could get a box of delicious cookies delivered right to your front door every single month and be a member of the most delicious club on the planet?